Nex Flow™ Air Jets are designed to reduce compressed air consumption and noise levels while maintaining laminar flow for strong blow off force. 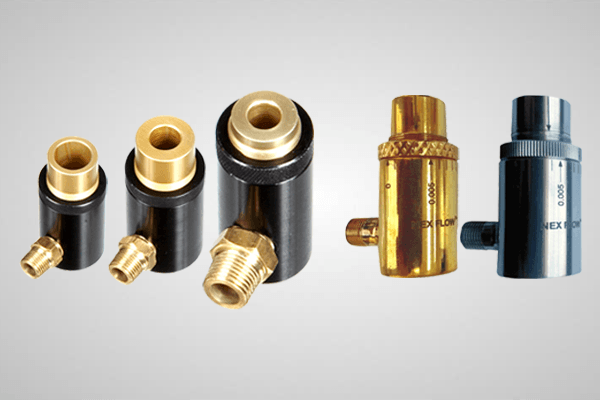 They entrain large volumes of surrounding air through the Jet (similar to Air Amplifiers) and are more efficient flow amplifiers than Air Nozzles. They cover a larger blow off target than a Nozzle and are ideal for part ejection. An air nozzle provides a point force, while the Air Jet acts more like a “hand” and covers a larger area in blow off coverage. This can be an advantage in part ejection where two nozzles are normally required to “direct” the ejected part while only one jet is needed. This can dramatically reduce energy required as well as have a lower footprint on the machine. All Nex Flow™ Air Jets meet OSHA standard CFR 1910.242(b) for dead end pressure. Noise levels are dramatically reduced in addition to lowering energy use. 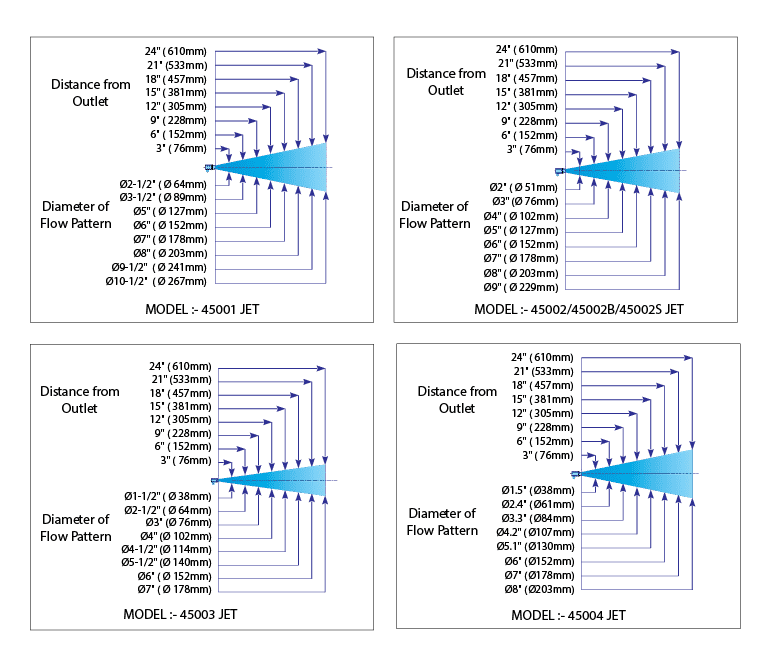 Nex Flow™ has three basic designs: The High Force Air Jet is the most popular to provide a concentrated high force and is the most popular style used for part ejection. The High Velocity Air Jet has a wider air exit and used mostly for cooling although it also has a high blow off force, but less than that of the High Force one. The Mini Air Jet was developed for tight spaces where a wider area output is required as compared to the point force of a nozzle. Each design is adjustable. With each Adjustable Air Jet, the flow and force can be set and “locked” in place with the lock ring for your particular application. Model 45001/45002 – High Flow Air Jet and High Force Air Jet are physically the same size. The only difference is a larger exit opening in the High Flow version for the amplified air flow. The high flow system is used more for cooling and light blow-off while the high force version is used mainly for heavier blow-off applications. Material is anodized aluminum. Model 45002S – High Force Air Jet in 316L Stainless Steel. The gap setting, with value marked on the body, can be locked into place. Ideal for high temperature and for food service heavy blow-off applications as well as for corrosive environments. Model 45003 – Mini Air Jet is the most compact with high force. It is adjustable and ideal for tight spaces. This is a unique size to Nex Flow™ and there is no equivalent competitive system. 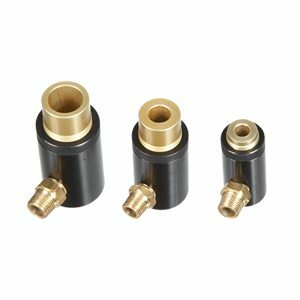 Model 45004 – Fat Air Jet Air Amplifier is the largest jet/smallest air amplifier with the same design as the high performance air jets to give you the most optimal performance with an adjustable gap and lock ring to set the gap in place. Model 45001, 45002 and 45003 Air Jets use a small amount of compressed air entering the annular chamber and exiting via a small ring nozzle at high speed over a “Coanda” profile. This creates a vacuum entraining outside air converting the pressure to a high flow output while maintaining a high blow off force. Energy costs and noise levels are reduced as a result.